Today, we officially kick off the release of a six-month wave of more than 25+ new capabilities and feature updates for Microsoft Flow. This update continues our commitment to deliver two major releases per year—in April and October—with new capabilities and innovations to help you stay ahead of rapid changes in your business and industry. 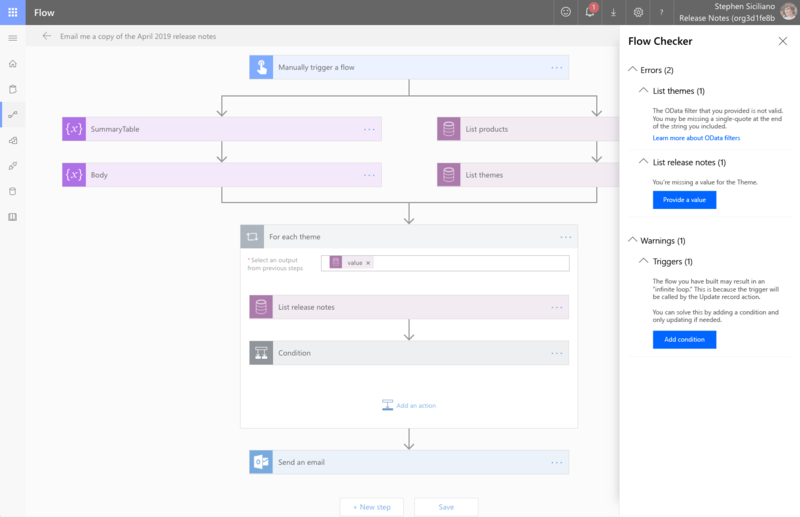 Microsoft Flow streamlines and automates the everyday mundane task, such as tracking emails, managing document version control, or aggregating and capturing data into a repository, such as the Common Data Services (CDS). Flow is modernizing business processes through digital automation and is the connectivity glue and empowers all users across a business – from End-Users to App Developers – to create digital business process flows with ease. It is the digital automation arm to the Microsoft Power Platform, which you can read more about in this recent blog post by James Phillips, Corporate Vice President, Business Applications Group. 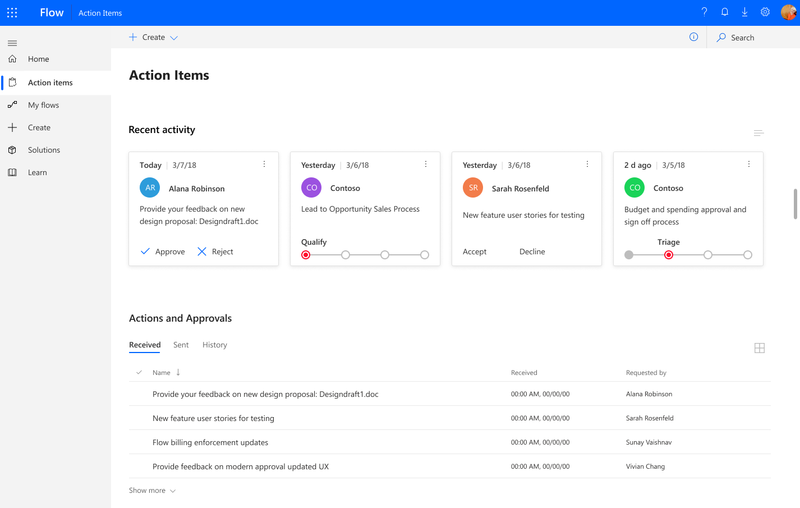 Microsoft Flow continues to improve and get better with time and the April ’19 update is no different, offering exciting updates across three key investment areas that continue to further simplify the way you work through new integration support across Microsoft Office 365 and Dynamics, new AI-enabled experiences and new availability with governance and compliance. Microsoft Flow offers a full-stack of integration solutions across Microsoft Business Applications, the Power Platform, and with CDS – not to mention there are over 230+ pre-built connectors to connect all your data. With this release we’ve introduced further integration capabilities with Dynamics 365 and Office 365 to helps organizations automate and extend processes directly from business and productivity apps like Microsoft Teams, OneDrive, and Power BI. A few key highlights include new built-in alerts in Power BI, which can be integrated with Microsoft Teams, the mobile app for Sharepoint or Flow, and text messages to further drive collaboration and automation. We’ve focused on rolling out the top requested features for Dynamics 365 and Common Data Service in Microsoft Flow. This includes support for calling on many of the custom actions defined in CDS. Additionally, with Flow’s user impersonation feature, step-by-step you can pull in the user’s identity so that you can act as each unique user who triggers the flow. 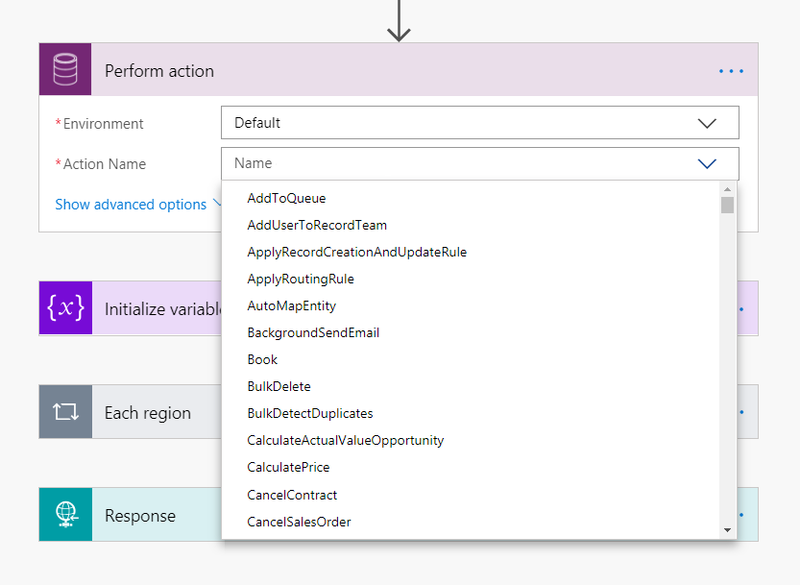 These new features will be available for flows created under the Solutions section in Flow. Microsoft Flow is a product of many real-life examples that look to simplify tasks through automation. With this release we’ve taken the feedback from our “real-life” users groups to add recommended remediation steps within the Flow Checker, and created a simple way to view errors through the actionable score card. All these investments are a continuation from October 2018, to further expand on AI-enabled experiences to support a broader user base with simpler tools through improvements with Flow Checker, faster approvals through the Action Center, and integration with Microsoft Learn. To further improve the experience of making smarter flows, this month we will be rolling out new functionality within the designer, such as Copy and Paste actions both within and across flows, and the ability to change or reorder actions with other dependencies. With this release we are doubling down on security and governance to support large-scale, enterprise-grade governance and compliance, across organizations with data security, data loss prevention management (DLP), and supportability. We are also excited to announce that Microsoft Flow US Government is now available, and Microsoft Flow US Government – GCC High is coming soon. This environment will support compliance with US government requirements for cloud services, including FedRAMP High, and requirements for criminal justice. You can read more about this recent announcement in the Power Platform and Dynamics 365 Updates for the Microsoft Government Cloud. In addition, to further aid cross-organizational processes, this April we are releasing the ability for approval processes within Microsoft Flow to include guest users. This means you can now send and include vendors or partners in approval requests. When they receive the approval email they can approve directly from within Outlook, or through the Flow portal – where they can directly sign and approve the request – even if they are outside of your organization. Read more about all features releasing from April 2019 through September 2019 for Dynamics 365, the Power Platform, Microsoft Flow in the official Business Applications Release Notes. Many of these features will be available starting this month – but other features listed here will roll out throughout the rest of the year. Stay tuned to this blog for updates of features as they become available for Microsoft Flow.